I can't believe I have not had rice pudding for soooooo long! Well, I had a ready made rice pudding couple of times. I mean, the one you can buy in any grocery store, but it does not count. What I am talking about is the yummy, lovely smelling home made rice pudding. Yes, that one which my mum made for my brothers and me. It always took infinitely long to get it cooked, from my point of view. I just could not wait to taste it's marvellous creamy taste. I loved it still warm when the smell of freshly cooked rice was strong, and any fruit on top was slightly melting and releasing it's own aroma. My mum usually served rice pudding with fresh apricots during summer and with home made apricot compote during winter, when no fresh apricot were available. When I am thinking about it, this was a first rice pudding I have made myself! And the best is, it was extremely easy to do. Yes, it is the kind of quick, easy, and very tasty dessert. I have mixed all leftover I found in a fridge, but the result was extraordinary! :) I guess, you can use just a coconut milk if you prefer more coconut flavour, or just a milk if you don't like coconut. As well, you can omit a double cream for a lighter dessert. I have chosen a cranberry sauce to finish the rice pudding, and I have to say, it was a good choice. I like the slightly sour taste of cranberries contrasting with sweet rice. 1 Wash the rice and drain well. 1 In a small pan mix the double cream, coconut milk and milk with the cardamon pods. Bring the mixture to the boil. 2 Add the rice and stir well. Cover and simmer over very low heat, stirring occasionally, about 15-20 minutes, until the rice is tender and most of the liquid is absorbed. If the rice is too dry, add a little milk and stir. 3 Discard the cardamon and add the palm sugar. Mix well. 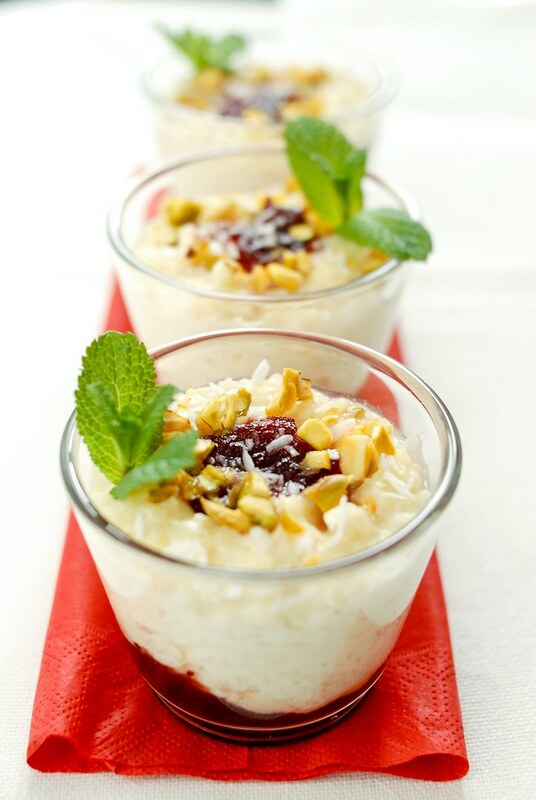 4 To serve, pour 1 tsp of cranberry jam into each glass and divide the rice pudding between them. 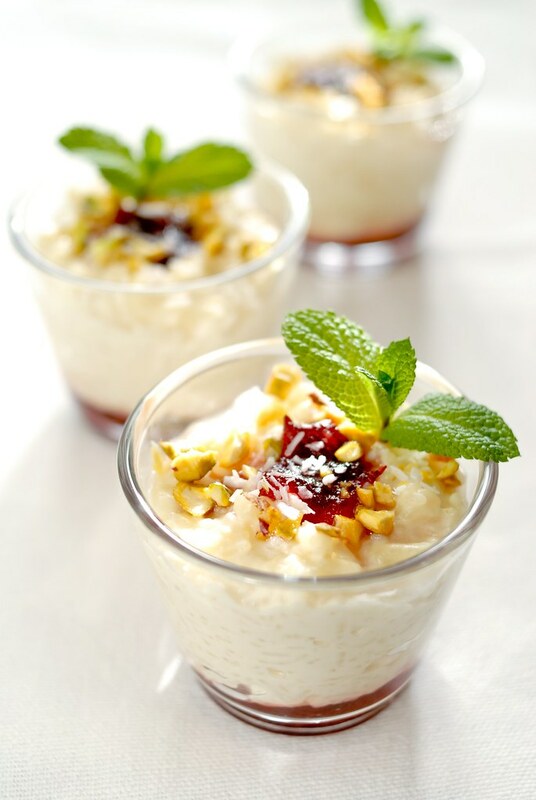 Top with another dollop of cranberry jam and sprinkle with coconut and pistachios. Finish with the fresh mint leaves. Serve warm or cold.